At heart, photographer Jason Hummel is a homebody. 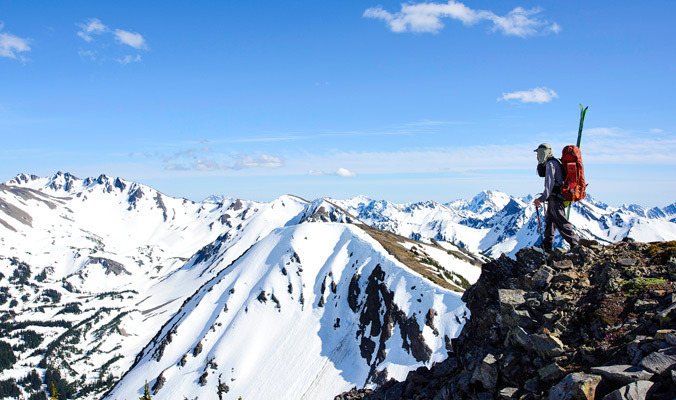 While the long-time contributor for Backcountry Magazine often travels globally, snapping shots of distant mountain ranges and athletic feats, his biggest project of late has been shooting and skimo-ing through his Washington home state’s mountain ranges. 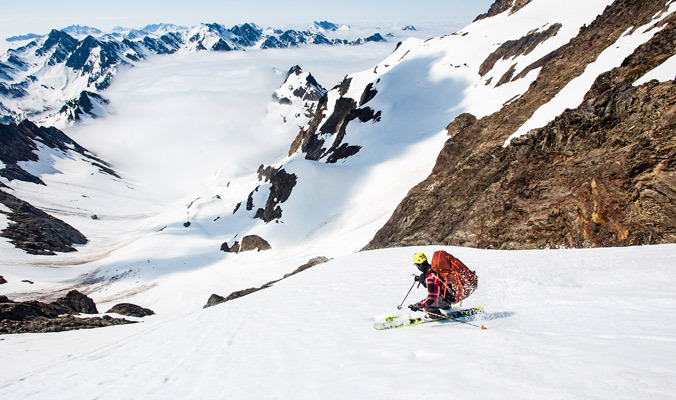 To give focus to his wanderings, Hummel is attempting to ski all of the named glaciers found in Washington’s Cascade and Olympic Mountains, a whopping 213 in all—Washington is the second most glaciated state, after Alaska. Since tackling 213 glaciers in one fell swoop is out of reach, Hummel’s been methodically working through different regions for a few years, keeping tally as he goes. 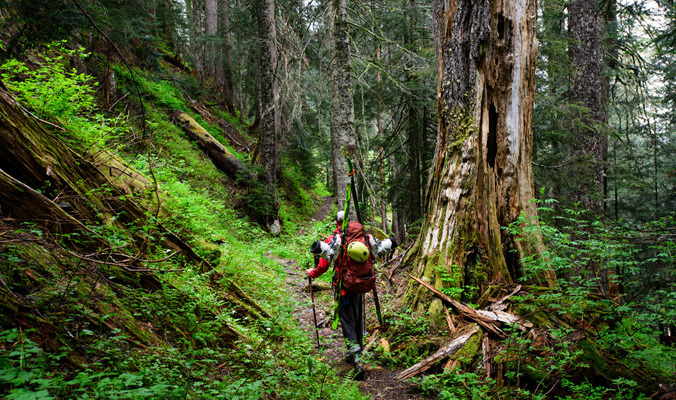 On a trip this past spring, he headed to the Olympic Peninsula to check a few of the remote Washington glaciers of his list. To learn more about this recent project, we caught up with Hummel, also featured in our December Photo Annual, to ask him about his motivations for this undertaking. Here is what he had to say in his own words. Day 1: Tim Black scouting the way ahead from McCartney Peak. I wanted to tie in all of the adventures that I’ve done in the Cascades; to intertwine all of those adventures into one theme. Also, I have been skiing for 215-220 months in a row now, and projects like this get me out when I don’t necessarily want to go and get me to places I don’t always focus on. It’s easy to fall into a pattern where you just do what you have always done. And I really needed to go to those places on the map that maybe weren’t the number-one destination. It’s kind of what my hope was in skiing all of these glaciers: to go out there and visit all of these remote places. Technically, there aren’t just the 213 glaciers—there are many more than that—but these are the major ones. This Olympic trip was inspired by connecting these out-of-the-way glaciers. I searched for ways to link together locations and peaks that people normally just don’t ski. 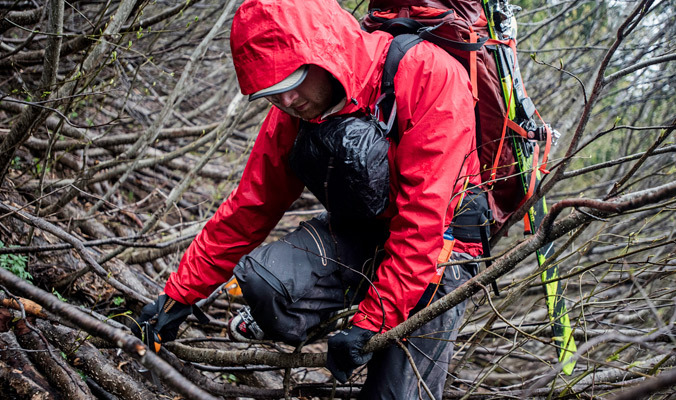 Even in Alaska, people have gear stashes every five or six days. Out here in the Olympics, there are no sleds; it all has to be on your back. When you’re out there, you are really out there. It is quite different than ski traverses are in other places. Tim Black crosses Cameron Pass on the duo’s way into Lost Basin. This is something I’ve been doing my whole life; these mountains are in my backyard. 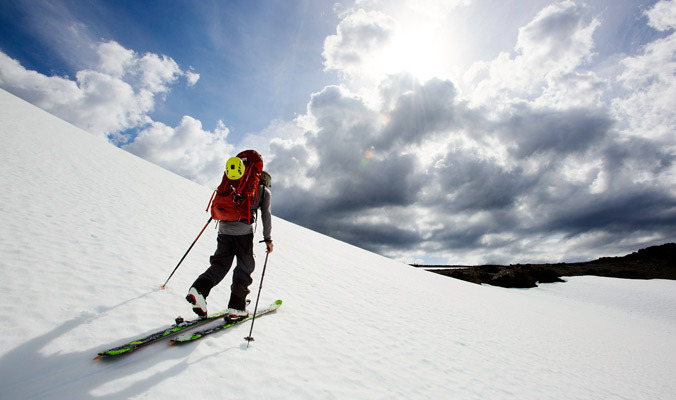 I came up with this idea a few years ago—to get out to places where no one has gone on skis. I want to experience adventures with an uncertain outcome. When you read about somebody who has done an adventure, you have preconceptions about what it is going to be like. So for me, it was great to go on adventures where I was pioneering new summits and traverses on skis. I like not knowing what the outcome might be, to turn question marks on the map into lifelong memories that brighten shady contours. Day 4: Tim Black battles vine maple on the way to the base of the Eel Glacier. Another thing is that there are a lot of glaciers that are disappearing. There used to be some massive ones that are completely gone now. Some are disappearing as we speak, and there are some that I’ve skied in the past that are gone as well. It’s crazy to see all that change, so this project is a way for me to ski and see places while they’re still here and to appreciate them as they once were. Day 5: Tim Black summits Mt. Anderson, the highest point in the north-to-south traverse, in a complete whiteout. Some of the experiences that I’ve encountered could keep me up all night telling stories around a fire. When I was a kid, I grew up skiing in the backcountry with my dad and brothers. It’s quite different from how people learn to ski at a ski area. There are no chairlifts; we earned every turn. One place that I have always had a connection to is Mt. Rainier, which had the most recorded snow in the world before Mt. Baker superseded it. And it’s a place that I’ve seen change a lot over the years. 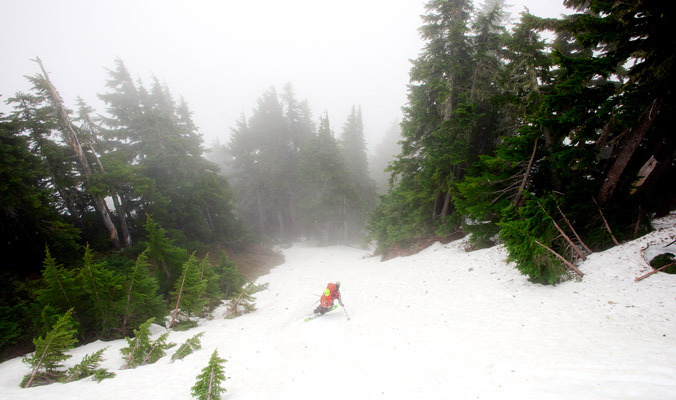 The Rainier Snowfields have regressed and melted back every summer. You see them go farther and farther up the slopes. The Nisqually Glacier has melted back over a mile. Over the years, I’ve just seen the mountains evolve and change. These mountains still see a lot of snow, and there’s a lot of variation year to year, but I also see where the glaciers used to be in the summers. 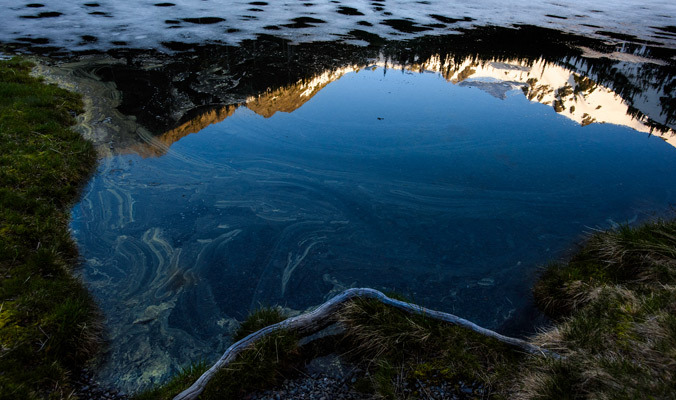 There are more terminal lakes that the melted glaciers have left behind; empty wastelands where ice used to be. Mostly I was suffering on this trip. I had 20 lbs. of camera gear on my back. There was a total of something like 90 lbs. in my pack. It’s especially trying when you are bushwhacking below snow line. 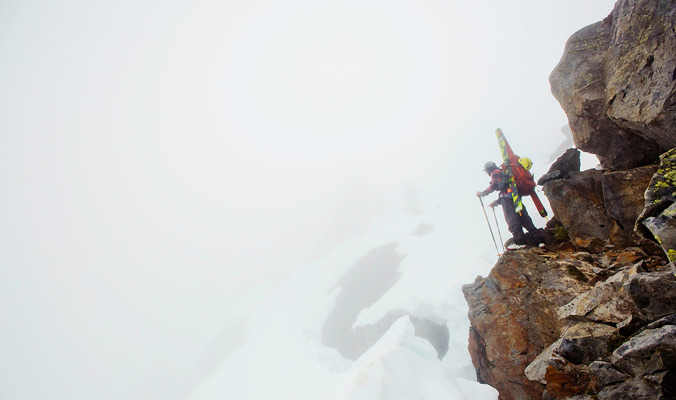 Tim Black descends from camp on Flypaper Pass toward Anderson Glacier. The days ahead can be seen in the distance. Often, the spring skiing in the Olympics can be incredible, but at times we get pollen that comes in, and it creates this black, sticky layer on the bottom of your skis that makes it incredibly difficult to ski. So after our first two days, we ran into that pollen, and it made it really difficult right off the bat for my partner Tim Black and myself. But a lot of times with these big ski traverses, even if the snow is really bad, you end up getting to these really cool places and peaks. On a trip like this, my focus changes from skiing to exploring and discovering summits and views. The snow quality is just a bonus. Skiing toward Anderson Pass on the way to White Mountain. I had a really difficult time finding people who were willing to go on a trip like this, because it wasn’t looking like the weather was going to be good. But also, people have 9-to-5 jobs, and it’s really hard to get people to take 10 or 12 days off if you don’t know how long the trip is going to take. Having that flexibility is a rarity. 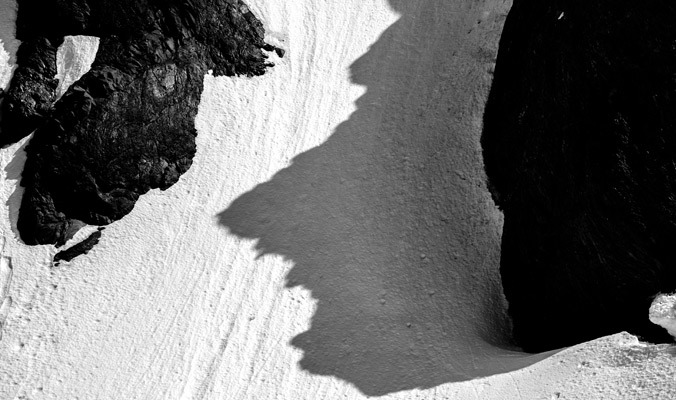 Most people want to ski a bunch of lines. Trying to get people into these adventures with a lot of question marks is difficult. With something like this, there is the potential that it may be the worst experience of your life. A lot of people want a hut trip in Canada where they ski pow lines all day long. But Tim Black went with me. He had just finished college, and he was able to get the time off. He’s a smart kid who has his stuff together. 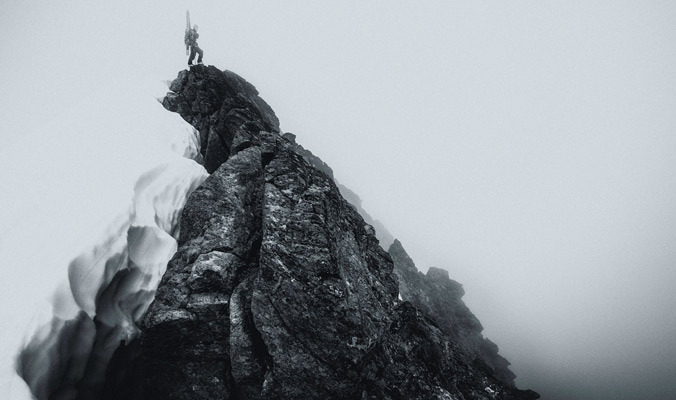 When you go into the mountains, it’s important to be organized and confident in your abilities. There’s not a lot of room for chance. He knew his limits, as well, and I love traveling with people like that. He knew when to say no. It makes it easier for me, and so it was wonderful to have such an easy-going, put-together, smart person along for the adventure. 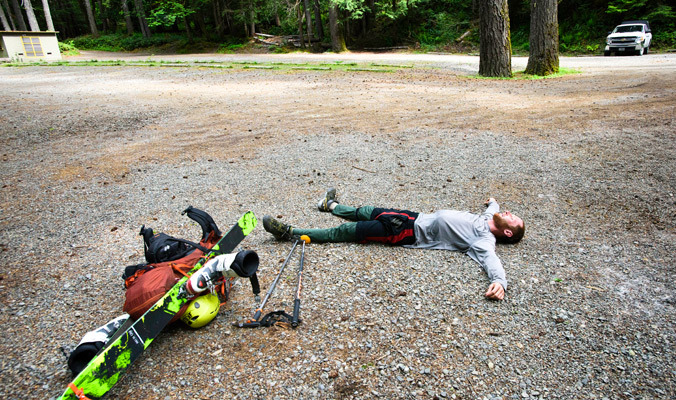 The final day: Starfished, exhausted and utterly content after an epic nine-day adventure across the Olympics. Find out more about Hummel’s quest to ski all of Washington’s named glaciers at www.alpinestateofmind.com.